Hello! It's Memorial Day weekend here, a time for us to remember and honor the brave men and women who lost their lives while serving our country. It also signifies the end of the school year (or close to it) for many of us, and the official start to summer. It's dreary and rainy here, so it doesn't feel much like summer, but my yard work is done, so I'm going to welcome the rain on my newly planted vegetable garden. This past week, we did a Father's Day focus in the Taylored Expressions newsletter. Here's the card that I made for my dad. I went for an artsy look by creating my watercolor background using Ken Oliver Color Burst. To be truthful, I love the look of watercolor, but I hate getting messy! The background was easy to create by randomly adding bits of the Color Burst powder on to watercolor cardstock, then spritzing with water. Once this was dry, I die cut the Ray of Sunshine Cutting Plate out of Sugar Cube cardstock, layed it over my watercolor background and stitched around. Accessories: Taylored Dies: Pinking Circle Stacklets, Ray of Sunshine Cutting Plate (TE); Color Burst: Lemon Yellow & Orange (Ken Oliver Crafts); Wood veneer stars (Studio Calico), Foam tape, Thread, Sewing machine. This is fabulous, Steph!! Love it :) We have a months before the kids are out and I can't believe it!! Where does the time go??!! I am not ready to have a Senior next year LOL! 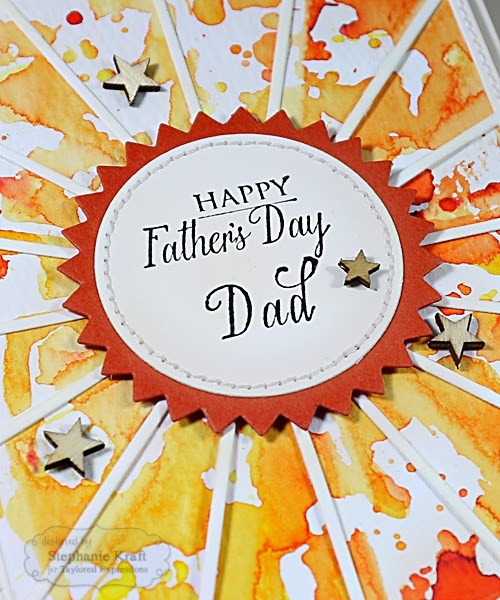 Fantastic Father's Day card Stephanie! 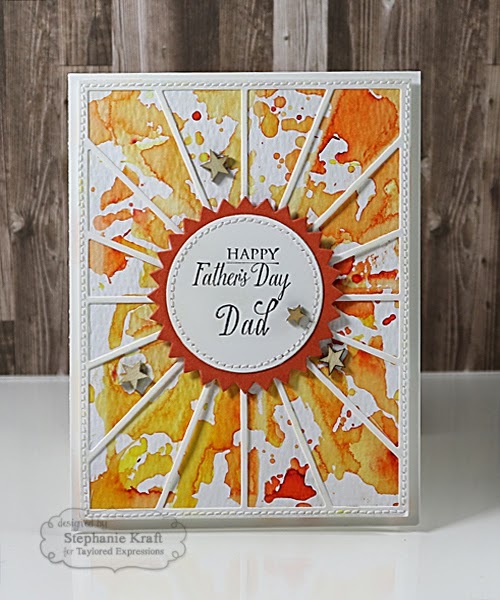 Love the inky background!